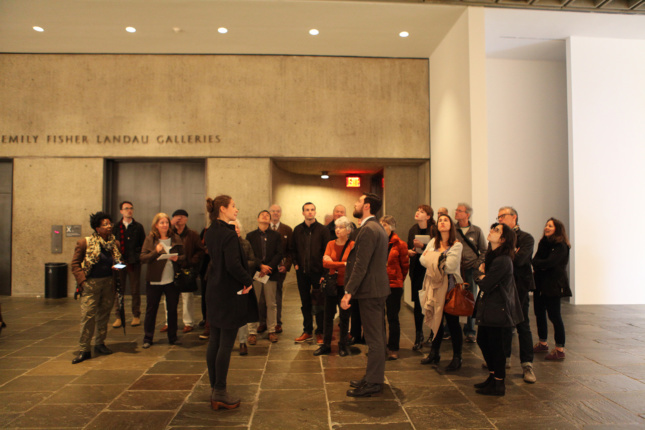 This is the twenty-second in a series of guests posts that feature Archtober Building of the Day tours! With only six days left in the month, the Archtober 2016 Building of the Day tours are sadly coming to a close. We’ve seen a variety of new and innovative spaces mixed with old favorites and hidden gems that presented a mosaic of New York’s most impressive architecture. 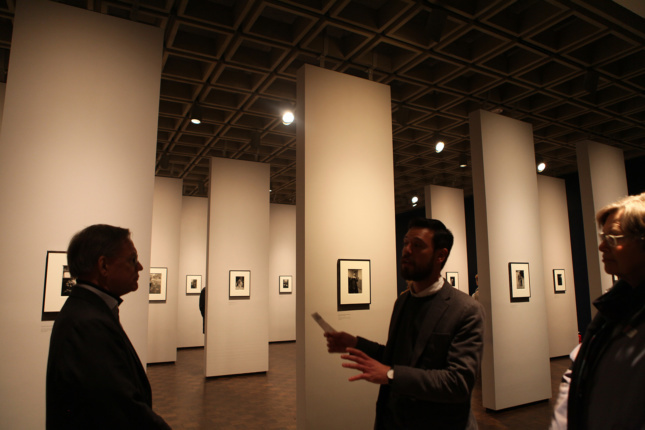 This year’s list would not be complete without Marcel Breuer’s iconic Whitney Museum, now known as the Met Breuer. 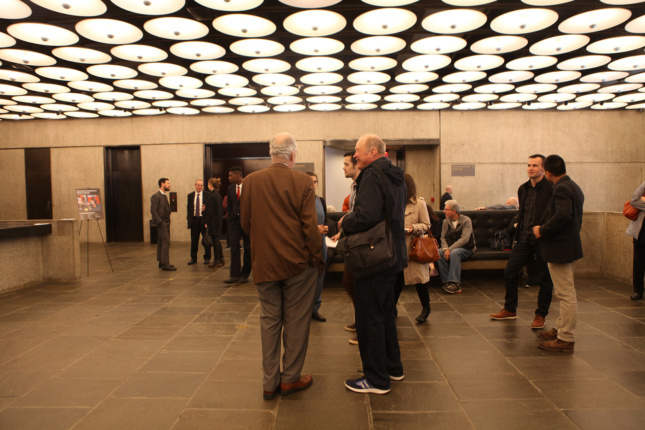 The Met Breuer, which opened in March of this year, houses the Metropolitan Museum of Art’s expanding modern and contemporary collections within its modest 29,000 square feet of exhibition space. When the Met moved into the building, its main goals were to restore and rejuvenate the space while still preserving the patina of the past. To that end, the Met gave the former Whitney the kind of exacting precision and gentle care it uses on its most treasured art objects. 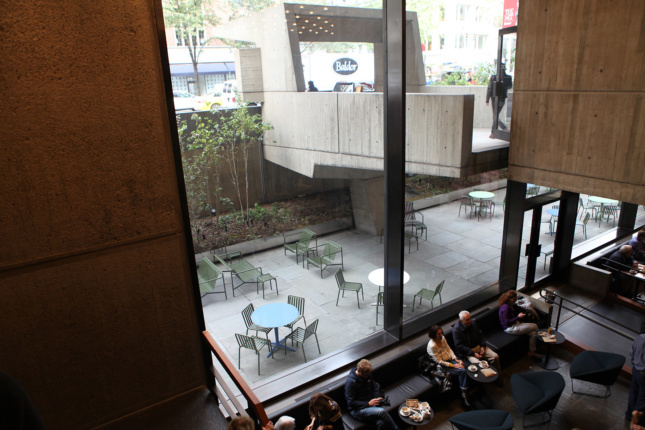 That precision and care resulted in a building that both honors Breuer’s original vision and updates the space to meet the challenges of contemporary museums. The Met enlisted the help of Beyer Blinder Belle, a firm that specializes in the revitalization of historic buildings and has significant experience with the restoration of other midcentury modernist icons (Eero Saarinen’s TWA Flight Center at JFK International Airport and Wallace Harrison’s Lincoln Center Promenade are two great examples). The restoration of the building took just under a year. 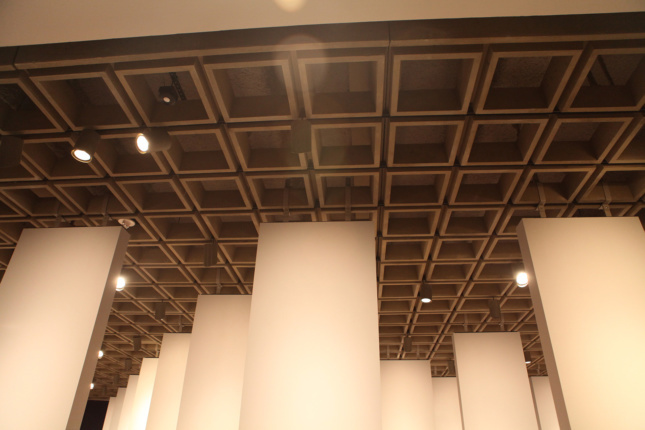 The updates that the Met and Beyer Blinder Belle incorporated show an informed understanding of Breuer’s subtle, graceful materiality and his ingenious structural engineering. A multitude of restoration and revitalization techniques needed to be devised for the various materials used in the building, which includes terrazzo, concrete, walnut parquet, and the famed gray granite exterior. The bluestone floors were treated with a natural, black wax to bring a soft luster while the walls, which required both chemical cleaners and water, were treated with a gentle, painterly approach. Breuer designed with the effects of time on materials in mind. The Met and Beyer Blinder Belle followed this example by leaving the bronze handrails of the staircase unfinished, allowing them to show their wear. The lobby showcases the updates made for a contemporary museum with greater visitor numbers. The space was completely redesigned with multiple ticket sales points, self-service kiosks, and a substantially decreased retail footprint. 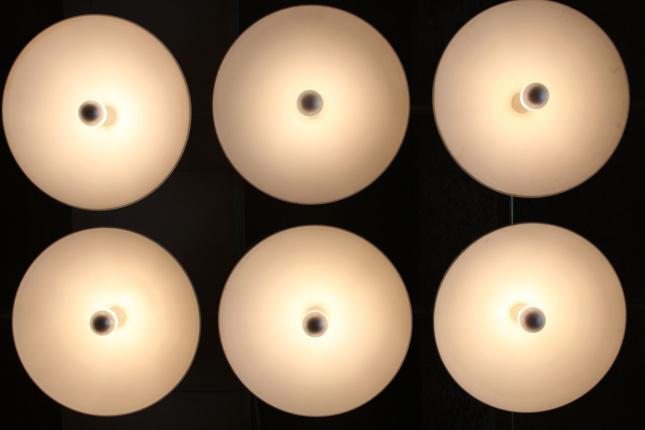 Additionally, the lighting in the lobby has been updated to Breuer bulbs that can dim and provide a warmer uniformity of color temperature. The plexiglass and stone information center originally installed has been changed to a LED screen. For the time being, the Met and the Whitney share ownership of the building. 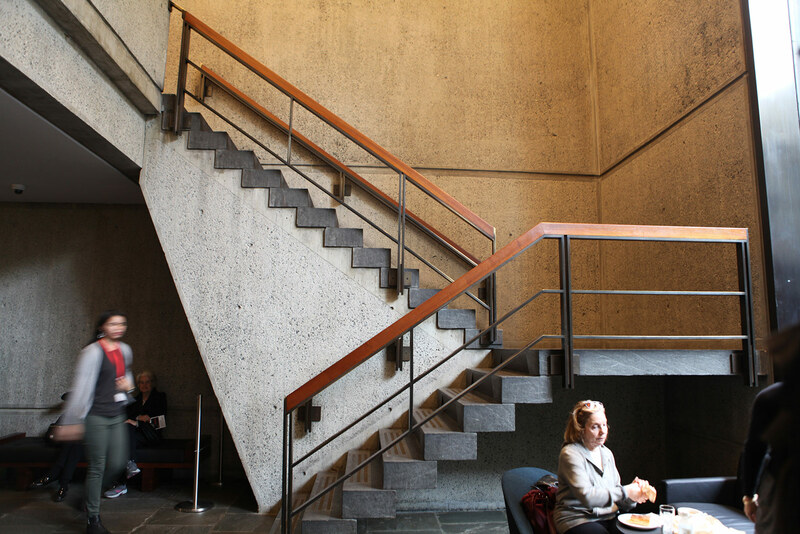 The Met will occupy the Breuer masterpiece for eight years, with a possible extension to 15 should the Met Breuer prove to be a success. Despite its fame, the Breuer building is not a New York City landmark. Perhaps with a new tenant and renewed interest in the space, the building will get the recognition it deserves. Otherwise, its fate will be another question for the city and architecture lovers, should the Met end up vacating. About the author: Anna Gibertini is a freelance journalist based in the New York metropolitan area. She contributes regularly to The ArtBlog, a Philadelphia-based arts and culture publication, and has had work published in Charleston, South Carolina’s Post & Courier and Syracuse, New York’s The Post Standard. She recently graduated from Syracuse University’s Newhouse School of Public Communications with a master’s in arts journalism.